The University already houses several powerful and versatile small animal imaging systems, including Bruker’s In-Vivo MS FX PRO and In-Vivo Xtreme 16MP optical/X-ray imaging systems and the Albira PET/SPECT/CT System. The partnership, which will be spearheaded by research assistant professor W. Matthew Leevy, an in vivo imaging expert at NDIIF, will provide more equipment and continued product and research support. Bruker Corp. is an international company with more than 6,000 employees working in more than 90 locations on all continents. Bruker systems cover a broad spectrum of applications in all fields of research and development and are used in all industrial production processes for the purpose of ensuring quality and process reliability. 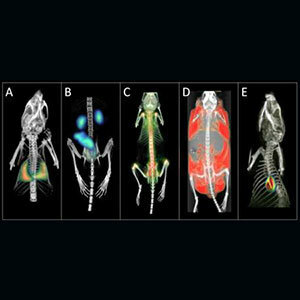 Due to recent acquisitions and internal development, Bruker now offers an extensive range of imaging modalities for preclinical research, including PET, SPECT, CT, microCT, MRI, fluorescence, luminescence, radioisotopic and X-ray. In the photo: Example PET, SPECT and CT images from the Albira at the Notre Dame In Vivo Imaging Facility. Originally published by Marissa Gebhard at news.nd.edu on July 23, 2013.